Paeonia Amalia Olson starts blush pink, but slowly turns to pure white while blooming. 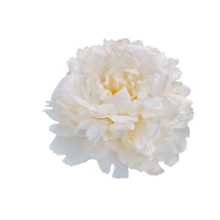 Its radiant colour and truly wonderful fragrance make this peony an ideal choice for festive occasions. Births and weddings for example. Amalia Olson is a double-flowered peony with extremely strong leaves that are pure green. The stems aren’t thick, but sturdy enough to carry the beautiful flowers. When Amalia Olson blooms, the flowers emit a wonderful fragrance that are guaranteed to fill the entire house. Amalia Olson was bred in 1956 by peony breeder Mr. Olsen, who named it after his mother. This peony variety was awarded a gold medal by the American Peony Society in 2011, in recognition of its beauty. Paeonia Amalia Olson must be cut at the right stage of maturity to successfully open, so check if it’s already showing some colour before buying.